Look at this fabulous lampshade that Linda made! 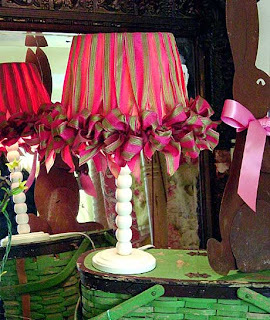 It's made of luscious wired ribbon in hot pink and olive green hues, bowed all around the bottom of the shade. It took about 30 yards of ribbon! And not even a dab of glue, believe it or not! We had two customers nearly fighting for it. Not really. They were very nice about it. It was agreed between them that the first who saw it should get first dibs. She indeed bought it...and even ordered a larger one to be made for a floorlamp. Hope you're having a good weekend. If you're in the neighborhood, you should definitely stop in to see us. It is looking so sweet and Spring-y! What a lovely color combination! Just beautiful! was it made from simply wrapping and tying the ends off. it is too beautiful. How did you do that? It's breathtaking beautiful!